Simplicity and style make 8ft inline displays an ideal solution for any event, retail, corporate or trade show environment. Popular displays such as Hopup™, Embrace™, Xclaim™, Coyote™, and Formulate® Fabric are available in 8ft widths, making it simple to find the right solution. Displays assemble quickly and easily to add a contemporary and eye-catching messaging or product display. Find your perfect 8ft inline display today! 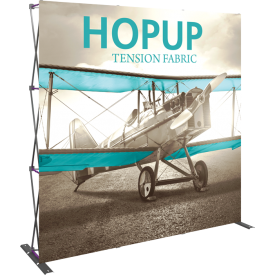 Hopup™ collapsible 8ft inline tension fabric displays feature an integrated fabric graphic that makes it the fastest and one of the easiest displays on the market. 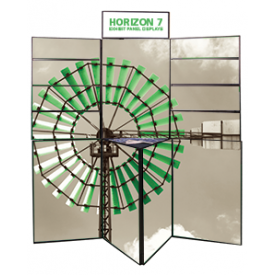 Simply expand the collapsible frame and you have a fast and impactful 8ft inline display. Hopup inline displays are available in straight and curved frame options, and are fitted with state-of-the-art printed fabric graphics. 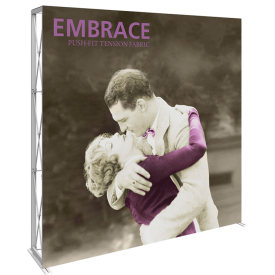 Embrace™ tension fabric 8ft inline display systems feature a collapsible straight silver frame and support a fabric graphic that attaches by simply pushing the graphic into a thin channel. A sleek, sophisticated appearance, coupled with simplicity and ease of set-up makes this system ideal for use at fairs, trade shows and more. 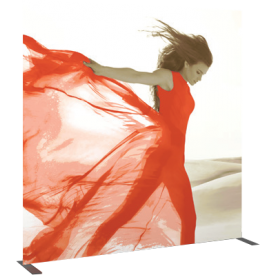 It is easier than ever to find a stylish, modern 8ft inline collapsible display with Embrace. Xclaim™ collapsible 8ft inline fabric popup systems combine dimension and simplicity, super stretch push-fit fabric graphics and a collapsible frame with magnetic locking arms to create a sleek, polished 8ft inline popup display solution. Xclaim inline displays come with a multitude of placement possibilities for the push-fit fabric graphic to draw attention and make your message pop! 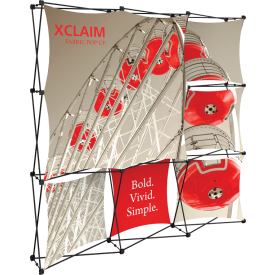 Utilizing a lightweight magnetic collapsible frame, Xclaim displays require no tools for assembly, and quickly set up and pack away. 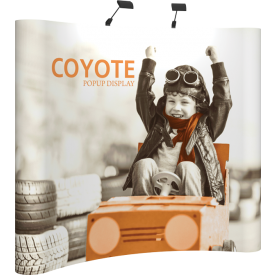 The popular Coyote™ Popup 8ft inline display system combines strength, reliability and style. Its lightweight and simple purple aluminum frame uses state-of-the-art Rare Earth "Neo Magnets" on its individual channel bars and locking systems, making it fast and easy to popup and breakdown. Coyote inline display systems are offered with a choice of Velcro receptive fabric panels or printed graphic panels for the ultimate flexibility in your display appearance. Coyote popup displays are portable, versatile, durable and easy. Make a stunning impression with Formulate® fabric 8ft inline displays. Available in Essential and Master collections, these 8ft inline displays are lightweight, highly portable and are easy to assemble with the use of push-button connectors or bungee cords to connect the aluminum tubes. Simply slip the fabric graphics over the frame. Straight, Horizontal Curved and Vertical Curved options are available, and displays easily create an impactful and sophisticated display. Accents such as counters, kiosks, iPad stands and architectural accents and more add function and style to the exhibits! Find your easy-to-assemble 10ft inline display today! Find your easy-to-assemble 8ft inline display today!